Does Jerry's Acura spot work? Anyone can tell you if a Super Bowl ad "looks good" or not. But Drew Magary, who spent over a decade working in advertising, is here to tell you whether or not a Super Bowl ad WORKS. Today, it’s Jerry Seinfeld’s new Acura spot. 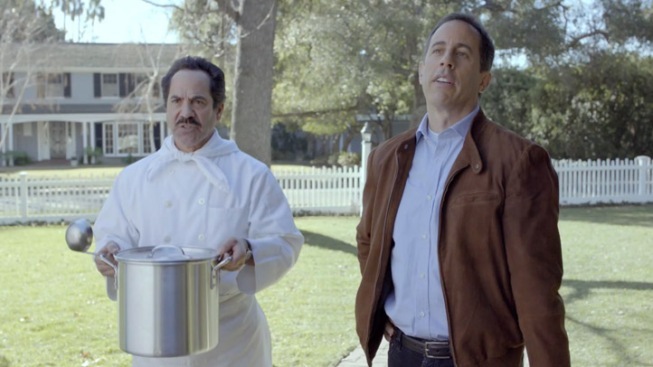 Once upon a time, Jerry Seinfeld was one of the more effective commercial spokespeople out there. His ads for American Express back in the late 90s still hold up today. In fact, after he ended his eponymous sitcom, Seinfeld entertained the idea of opening up an ad agency of his own. That never materialized, and Seinfeld now spends most of his time talking with other comedians about being funny rather than just, you know, being funny. So it’s refreshing to see that, for the Super Bowl, he’s jumping back into the ad game, this time with a new corporate partner: Acura. You’ll note that Honda, which owns Acura, already made waves this week using Matthew Broderick in a Super Bowl ad. Will Jerry make the same kind of magic? Let’s answer a few questions. Do we know what this ad is about? Yes. Jerry is at an Acura dealership and has his eyes on a new NSX. The only problem is that there’s a waiting list, and some other schmuck is at the top of it. This results in Jerry offering a series of progressively nuttier bribes in exchange for the man’s spot atop the waiting list. That’s it. That’s the whole spot in a nutshell. Wait, wasn’t the NSX discontinued in 2005? It was. But Acura is bringing it back to the market, I guess because the economic climate is right for the reintroduction of an impractical sports car that will cost far more than the average American can afford right now. Is that the Soup Nazi? Indeed. Actor Larry Thomas is reprising his famous “Seinfeld” role. The problem is that this is about the only thing noteworthy about his appearance. He doesn’t actually do anything. Bringing out the Soup Nazi is just one of many, many wacky things that Seinfeld does to get this car, including offering the man the last living munchkin (to own? to rent? ), showing him a holographic dancing monkey, staging a sock puppet play for him, buying him a cigarette boat, showing him a dead alien (huh? ), and more. Is any of this funny? Truthfully? No. It’s like a list of jokes that the ad agency failed to edit down to a manageable length, like a sketch that goes on for too long. The only charming part is when Seinfeld offer to make small talk with the omelet guy. That’s closer to Seinfeld’s brand of humor. The rest just seems like expensive antics. What’s the capper to this spot? It’s Jay Leno flying in with a flying suit and snatching Jerry’s place in line for the car (which you will have long forgotten about). Does this spot work? NO. It’s not very funny, not all that creative, and the whole plot idea of Seinfeld being denied a car that he could almost certainly acquire with ease is stupid.